The content of this book has been approved by senior veterinary officials. 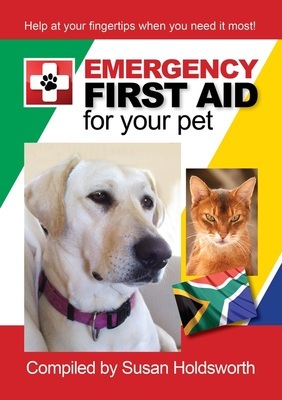 What is really important is that pet owners know what to do in a medical emergency! If you own this book, you do not need a special first aid kit as all first aid kits (for humans) carry the necessary equipment needed. With the purchase of each book is a suggested list of contents for a first aid kit. Please remember that medicine for human use is not to be administered to dogs and cats. Bleeding occurs when there is a break in the soft tissues of the body and blood is able to escape from the blood vessels. · CLOSED WOUND - there is no break in the outer layer of skin but there is internal bleeding which may be severe. The risk of infection is low except in internal abdominal injuries where the risk of infection is high. The primary aim in the care of wounds is to stop the bleeding and prevent infection. Most wounds may bleed excessively, therefore working quickly in cleaning, bandaging and getting professional medical care prevents further injury, infection and promotes a quicker healing period. Arterial blood is bright red and spurts with each heartbeat. This is very serious and maybe hard to control. Venous blood is dark red and flows more steadily. It may be easier to stop and control than arterial bleeding. A sterile gauze or pad (even a towel) should be placed over the wound. Do not use cotton wool directly as the cotton fibres may get stuck in the wound. If the blood seeps through the gauze - do not remove the dressing - just add more gauze or cotton wool on top, press down firmly and transport the animal immediately to the veterinary hospital. Keep the cat/dog calm. Make sure your pet can breathe through his mouth. Take note if the bleeding is from one or both nostrils. If his gums are pale or light blue - immediately transport to the nearest veterinary hospital. · A foreign object –such as grass seeds, insects, etc. For all of the above cases keep the pet calm, and transport to the veterinary hospital. Injuries to an animal’s paw can happen anywhere – at home or in the bush. As paw pads contain many blood vessels, the wound may bleed profusely. If broken glass is the cause of the wound – allow the blood to flow briefly and then flush with water – this may dislodge any glass chips. Cover the wound with a sterile dressing and press firmly to stop the bleeding. If blood soaks the dressing - do not remove, instead add more layers of gauze or cloth. Do not attempt to make a tourniquet as this will hurt the animal unnecessarily and will stop the circulation causing further damage. Do not apply ointments without the approval of a vet. Seek veterinary care if the bleeding is profuse and continues for longer than 20 minutes. If the animal has an object, such as a stick or a knife, protruding from its body, DO NOT ATTEMPT TO REMOVE IT! This may cause internal bleeding, open the wound to infection and may increase the shock and pain the animal is already experiencing. In the event that the object is removed from the chest and there is a sucking noise from the wound, cover with a sterile dressing to prevent further air entering or leaving the body through this injury. The injury is called a pneumothorax and involves damage to the lungs. The lung may actually collapse requiring urgent medical attention. Transport carefully to the veterinary hospital.